Let’s face it, moving can be stressful. It’s a huge disruption to your life and your kids’ lives too. There’s so much to do, and so much to organize. You may be worried that your belongings won’t arrive safely, or about damage to your home. Cassidy’s knows that moving should be an adventure, not a chore. Local, National and International moving services. Complete or partial packing services. Sales of moving boxes and supplies. Self-store and move using shipping containers. Temporary indoor or outdoor storage rental. Cassidy’s is one of the Ottawa area’s oldest moving companies. Founded in 1908, you could definitely say that experience has taught us a lot. Primarily, it has taught us that packing and moving carefully are skills. We hire honest, bondable workers who care about doing a good job, and we give them training on everything from packing glassware to loading trucks properly. Our core team of career movers takes personal satisfaction in having everything arrive safely. Many of our movers have been with us for 10 years, 15 years, or even longer. Every Cassidy’s moving team includes veteran movers. We ensure we always partner newer workers with our experts every time a piece of furniture is picked up and placed in the truck. It all starts when you contact us for your free moving estimate. You complete the form on this page. A moving consultant visits your home to review what needs to be moved. We discuss all the options with you and provide pricing. You receive an estimate in writing. You contact us to confirm you’d like to book us, and we confirm your date. Moving day arrives, and the fun begins! Questions? Ask for a free quote to find out more. Bonded movers supervised by team leaders with 10 – 15+ years’ experience. Rated A+ with the Better Business Bureau and the Canadian Association of Movers. Awarded the BBB Honour Roll in 2014. Guaranteed moving estimates in writing. Full insurance that even covers damage to your home. We protect your floors with floor runners and blankets. Free use of high-quality boxes and blankets are included with our full packing services. We also include free mattress bags and furniture wrap. As Ottawa’s most trusted mover since 1908, we have a history of providing top quality services. 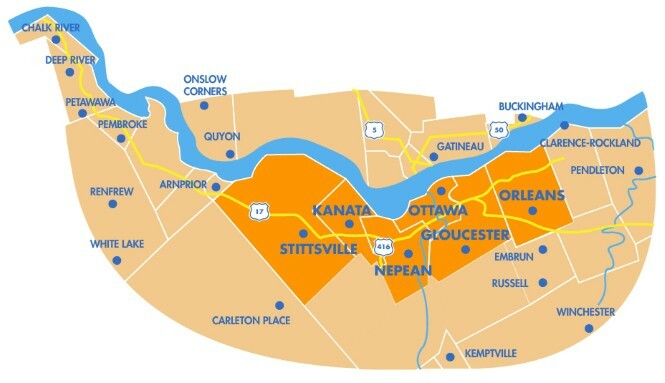 We service the entire Ottawa area and beyond – for everything shaded on the map, our local rates apply. If you’re moving long distance, we have additional information just for you. If your town is in this area but not on the list below, it’s probably still a local move. Get an online quote using our online form, or contact us to talk to one of our Moving Consultants.